In 1933, the future of the automotive industry was bright and wide open. Concept cars were often wild and impractical, but few were crazier than the Dymaxion car from eccentric designer and architect Buckminster Fuller. Plenty of Fuller’s many inventions bore the name Dymaxion because he intended them to be part of an overall futuristic and convenient lifestyle. The 1933 Dymaxion car was intended to be a streamlined, fast, fuel-efficient dream that would propel the automotive industry into its next generation. Fuller designed the car with a teardrop shape, which offered the least amount of air resistance. 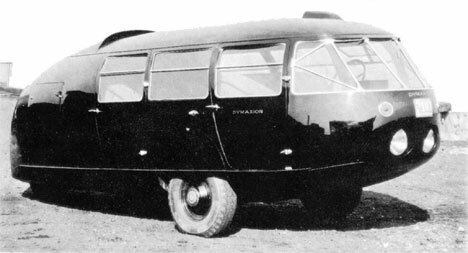 The Dymaxion featured only three wheels: one in the back and two in the front. Ultimately, Fuller’s vision was to make the cars able to travel by land, sea and air once suitable materials and technology became available to facilitate the latter two modes. Although larger than other passenger vehicles of its time at 20 feet long and six feet tall, the Dymaxion got around 30 miles to the gallon and was said to be able to travel at speeds of up to 120 miles per hour. The large vehicle could make a U-turn in its own length and parallel park with ease thanks to its unique setup and steering. Unfortunately, only three Dymaxion cars were ever produced. The first was involved in a fatal crash at the 1933 Chicago World’s Fair, an event which scared investors away from the project. It’s been said that the Dymaxion fell victim to a greedy auto industry which feared the futuristic car would ruin other models already in production. Whatever the reasons for its demise, the fascinating car lived on in the influence it had on later automobile designs. See more in Retrofuturistic or under Vintage & Retro. May, 2010.